The Healing Power of Meditation for the Grieving! New Afterlife TV Episode! The Healing Power of Meditation for the Grieving - New Video! Watch the new Afterlife TV Episode hosted by Best Psychic Directory's founder, Bob Olson . . .
Bob Olson talks with Jennifer Farmer about meditation for grief healing. See Jennifer's profile on this directory - click here. NEW AFTERLIFE TV EPISODE: Featuring an interview with intuitive and medium Jennifer Farmer, who visits the studio and discusses meditation, intuition, and butterflies. Bob also lets everyone know about his new project that serves as an example of how our spirit guides guide us. "In today's episode, we'll be discussing a question we've gotten from so many of you over the past few months: Where has Bob been? I'll explain exactly where I've been, the exciting new endeavor I've started, and the part I believe my spirit guides played in all this. "Also in today's episode, I have Jennifer Farmer in studio, which is a rare treat for me to have someone sitting in the same room. Jennifer is a psychic and medium who gave me an extraordinary reading eight years ago. We've been working together ever since. Jennifer shares how meditation can help us connect with our loved ones on the other side. She candidly reveals why the Orlando shooting tragedy inspired her to create a tool to help people find peace in suffering. This resulted in the special meditation program for the bereaved that she created for this purpose, which I personally love. "We also chat about intuition, signs from spirit, and creating a new relationship with our deceased loved ones. Jennifer even shares the signs that led her to quit her safe corporate job to serve full time as an intuitive and medium. There's a lot more here than meditation alone, so you'll definitely want to listen. More Show Notes . 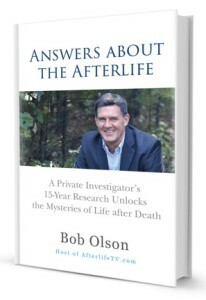 . .
Bob's book, Answers about the Afterlife, is available on Amazon in both paperback and Kindle.